Building on its initial release, 2018 Panini XR Football applies the many x-based designs to even more NFL stars and the new draft class. Similar to 2017, the 2018 Hobby boxes average three hits, including one rookie autograph relic, one additional autograph, and one memorabilia card. Each case should contain a one-of-one autograph. Featuring a new design, the 160-card XR NFL base set adds Red (#/299), Blue (#/199), Orange (#/75), Gold (#/10), Green (#/5), and Black (1/1) parallels. Inserts are fairly limited in 2018 Panini XR Football, with just one per box. Among the choices here are dual-player Mirrored (#/49), pairing a veteran and rookie, which is also issued in Red (#/25), Blue (#/15), Orange (#/10), Gold (#/5), Green (#/3), and Black (1/1) versions. The 2018 Panini XR Football checklist supplies quite a few different hits, as well, especially for the rookie players. The selection includes Rookie Swatch Autographs, Rookie Triple Swatch Autographs, and Rookie Jumbo Swatch Autographs. One auto-relic RC is expected per box, and each set offers premium patch, tag and shield editions. Working with the base look, the Rookie Autographs set is numbered to 199 or less with Gold (#/49 or less) and Black (1/1) parallels. 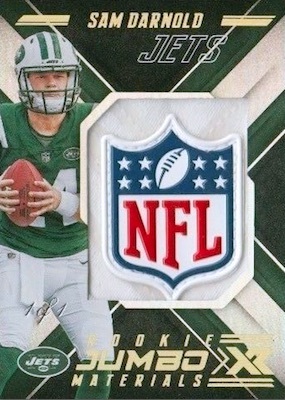 Another rookie-focused insert is Luminous Endorsements. Displaying on-field progression images, autographs are signed directly onto acetate pieces. 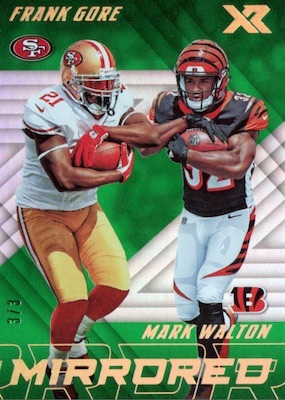 Of course, that's not all 2018 Panini XR Football has to offer. 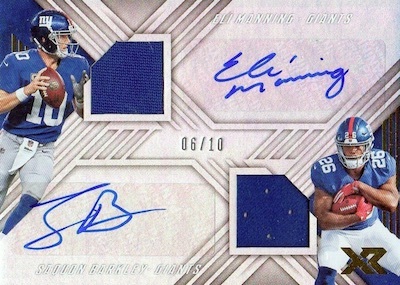 The Dual Autograph Swatches insert combines a rookie and veteran teammate, with a signature and relic for both. In addition, the Triple Autograph Swatches set honors some of the all-time greats of the NFL in groups of three. Finally, joining the two autographs in every box is a Jumbo Swatch or Triple Swatch relic. PARALLEL CARDS: Red #/299, Blue #/199, Orange #/99, Purple #/25 (Panini Rewards), Gold #/10, Green #/5, Black 1/1, Printing Plates 1/1. PARALLEL CARDS: Red #/75 or less (No Lamar Jackson*) Blue #/49 or less, Orange #/25 or less, Gold #/10 or less (No Lamar Jackson*), Green #/5 or less, Glove 1/1, Hat 1/1, Jacket 1/1, Prime Football 1/1, NFL Shield 1/1, NFLPA Tag 1/1, Nike Swoosh 1/1, Super Prime 1/1, Printing Plates 1/1. Buy 2018 XR NFL autographs on eBay. PARALLEL CARDS: Gold #/10 or #/5 (No Peyton Manning*), Green #/5 or less, Tag 1/1, Super Prime 1/1, Printing Plates 1/1. PARALLEL CARDS: Gold #/10 or #/5, Green #/5 or less, Tag 1/1, Super Prime 1/1, Printing Plates 1/1. PARALLEL CARDS: Red #/75 or less, Blue #/49 or less, Orange #/25 or less, Gold #/10 or less, Green #/5 or less, Jacket 1/1, Prime Football 1/1, Super Prime 1/1, Glove Super Prime 1/1, Hat Super Prime 1/1, NFL Shield 1/1, NFLPA Tag 1/1, Nike Swoosh 1/1, Printing Plates 1/1. PARALLEL CARDS: Red #/75 or less, Blue #/49 or less, Orange #/25 or less, Green #/5 or less, Glove 1/1, Glove Brand Logo 1/1, Brand Logo 1/1, Hat Team Logo 1/1, Laundry Tag 1/1, NFL Logo 1/1, Team Logo 1/1, Super Prime 1/1, Printing Plates 1/1. PARALLEL CARDS: Gold #/10 or less, Green #/5 or #/3, Super Prime 1/1, Tag 1/1, Printing Plates 1/1. PARALLEL CARDS: Blue #/35 (Dalton,Beckham #/20*), Orange #/25 (Dalton,Beckham #/10*), Gold #/10 (Dalton #/5*), Green #/5 (Dalton #/3*), Tag 1/1, Super Prime 1/1. PARALLEL CARDS: Blue #/49, Orange #/25, Gold #/10, Green #/5, Super Prime 1/1. PARALLEL CARDS: Red #/35, Blue #/25, Orange #/10, Gold #/5, Green #/3, Black 1/1, Printing Plates 1/1. View the full 2018 Panini XR Football checklist spreadsheet. Just another Panini product with event worn relic cards. I don’t want a Barkley jersey card, or any other rookie, with a jersey he wore to the rookie phot shoot. I want game used. Especially if I’m buying something that’s giving me only 14 cards for over $100.00. This is also the 5th product, that I can think of, so far, for this season & it’s still over a month before the season starts. Panini is causing me to lose interest in the hobby. I’ve been collecting since 1980 & I think it’s time to just stick with baseball. 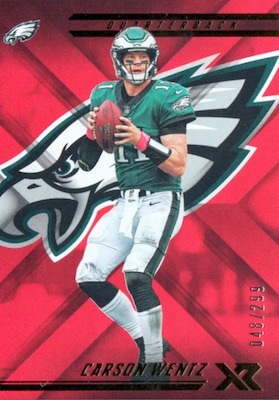 By my count and including XR, we are up to 16 Panini NFL sets for 2018. Always a great product every year. Some of the sickest 1/1 Laundry Tag and Shields. Well designed and great looking. Unfortunately, that is where the positives end. Player/Event worn material with sticker autos. 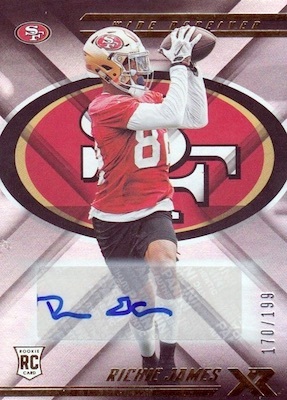 If you can give stickers to players for autos, you can very easily provide them cards to actually autograph. Won’t be a product I will be purchasing, nor will I be participating in any breaks. A follow up to my previous rating. Changing my rating to a 1 star due to the fact that players like Bo Scarbrough are in the set. He didn’t even make the team! Really nice looking cards but photo shoot jersey cards are a big negative. 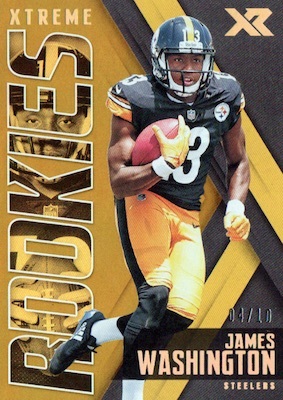 Look when jersey cards were first released years ago as insert the card manufactures could get away with photo shoot jersey because the idea of having an actually piece of the jersey was a cool new concept but nowadays when most jersey cards are a dime a dozen photo shoot jersey cards are a complete waste of time. 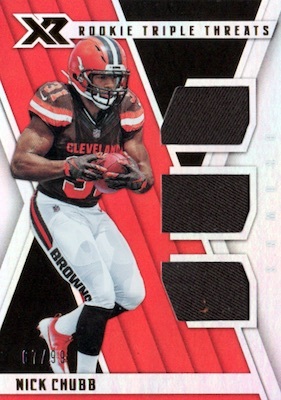 Look if a card manufacturer is insistent on using photo set jerseys they need to be at least serial numbered with patches, tags, or multicolored swatches to at least make up for it. So the good part of this product: the cards look great. The team logos in the background with the player in the foreground looks nice, especially when it comes to the parallels. Inserts also look pretty solid, too. The bad, however, is that the product more often than not offers incredibly bad value for money. A $100 box netted me an /199 Braxton Berrios auto and a Keke Coutee redemption, along with a Kalen Ballage jersey relic /25. The lowest-numbered parallel in amongst this was /99. 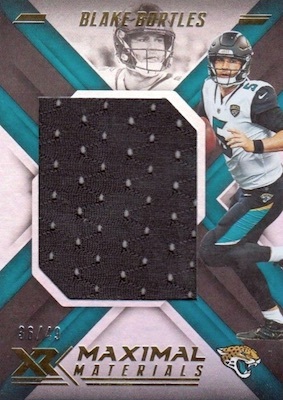 Good stuff can come out of this product, but the majority of the breaks I have seen online have ended with a similar box full of mid-to-late rounders who may not even have made the final roster or not. Given the price point and the number of cards, that’s pretty unacceptable. This product could be nice, but it needs better hit distribution or a lower price. As it is now, it’s hard to recommend. I would have rated higher except that I don’t understand why Michael Strahan was repeated again for the 2018 Gilded Greats set. There are only 20 cards in this set and with so many deserving Hall of Famers, why on earth would you repeat Michael Strahan in the 2018 set? He is the only one from the 2017 Gilded Greats set that was repeated. Did someone screw up and not realize he was already in the previous year’s set? I don’t get it. I cannot complain. Always buy my boxes from my lcs. First box pull a Raguan Smith 1/1. Hate Georgia SEC so I sold it on Ebay for $180 and bought what I wanted. Today, I had $100 and wanted some black Friday packs. Bought another XR. Low and behold and Zeke 1/1 NFL Shield and Clowney 1/1 NFL Shield. Also a 2/5 Daurice Fountain sick 3 separate patches plus auto and three patch (glove, Jersey and football plus auto numbered 66/199. Can it get any better buying 2 $100 boxes one month apart. A+ stuff. I am new to collecting and curious on why there are no Chiefs base cards? Does anyone know the answer to this? All checklists are different and it just comes down to what Panini decides to include. There could be any number of reasons to explain it but there is never a guarantee that all teams will be covered and certainly not equally. Though, it is odd to have 31 of 32 teams in the base set.